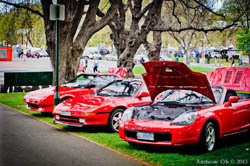 MR2 Nationals is a bi-annual event run by the MR2 clubs of different states. The host of events include track days, scenic drives, show ‘n’ shine and dinner, along with other MR2 owners from all over the Australia. Previous Nationals were held in Canberra/ACT, Bathurst/NSW, Bright/VIC, Hobart/TAS and the next host state is Queensland. Information on MR2 Nationals 2015 is now posted on the QLD club website. The proposed dates are Queens Birthday long weekend, 6th ~ 8th June 2015.